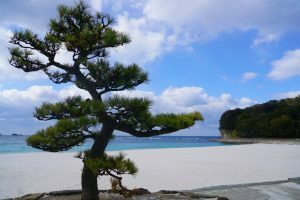 We skipped Kochi City and drove straight to Katsurahama 桂浜, a scenic beach 30 minutes south of central Kochi. We saw a statue of Kochi’s favourite son, Sakamoto Ryoma, one of the architects of modern Japan who helped to bring an end to Japan’s feudal age in 1868. He. We did not visit his memorial museum as most of the information would be in Japanese. We had a nice lunch in a local restaurant before taking R55 heading to Ioki Cave伊尾木洞 in the Aki City. On our way, we saw a sign of Temple 32 Zenjibuji禅師峰寺. Kylie kindly drove me to the temple which is again located at a hill top. Around 2 pm, we arrived in the cave formed from earth layers laid down some three million years ago. 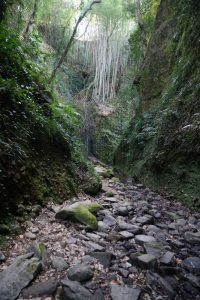 We spent an hour exploring this natural wonder with a large variety of ferns. 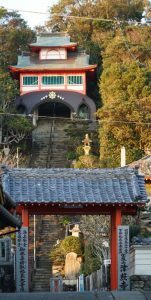 Before arriving at Cape Muroto, I climbed a steep staircase to reach Temple 25 Shinshoji 津照寺and had my book stamped just before the office closed at 5 pm. We raced to Cape Muroto室戶岬 just in time to catch the sunset. We found a good location. 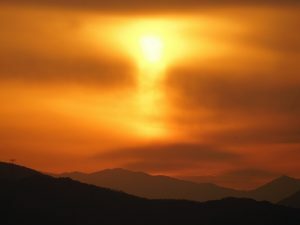 Kylie who has done her research about the Omega sunset in the Ω shape produced by inferior mirages over water, was anxious to take a perfect photo. 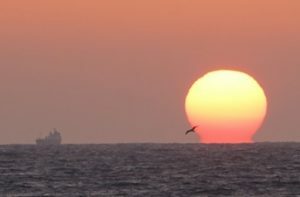 I had not read the carefully prepared notes and was just mindful of watching the brilliantly red sun dropping gradually below the horizon with an occasional bird, a couple of boats and rocks along the shore in the foreground. I did not learn about the Omega sunset till a man in a car park asked Kylie to show him photos she had taken. When I looked at mine, I was excited to find a couple with the Ω shape too. Wonderful! Then we drove to Hotel New Sun Palace located on the hill. We paid ¥9,000 for a twin room in Japanese style with toilet and ¥2,000 for breakfast and dinner pp. We got up early hoping to catch an Omega sunrise. 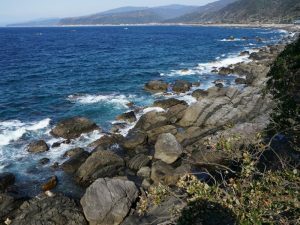 We found an excellent spot near Utoco Auberge and Spa on the east coast. But there was no sunrise as it was too cloudy. We drove back to the hotel, had breakfast after 8:30 am and departed after 9 am. We had a busy morning. First, we drove around the hill top to see a lookout point near the observatory. 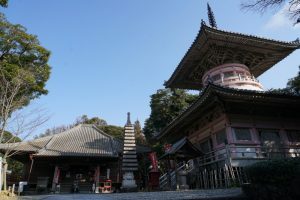 Then I visited Temple 24 Hotsumisakiji最御崎寺 located near the light house. 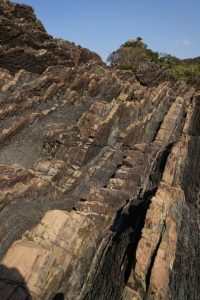 We returned to the eastern side of the peninsula to visit the Muroto Unesco Global Geopark 室戶世界地質公園 and explore the coast with amazing volcanic rock formations including the Meotoiwa (a married couple) Rocks and rocks uplifted by plate movements. There is a cave where Kobao Daisi had stayed. I got a stamp from the office too. 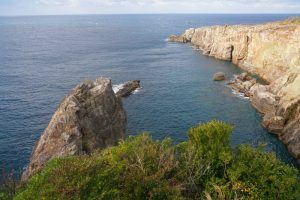 We made a brief stop at the Gyodo Cape with impressive rock formations. I found another caves where Kobo Daisi had meditated. Our final stop before heading to Iya Valley and Oboke was Kiragawa with historic streets with traditional houses 吉良川町傳統街道. Kylie loves to visit the Monet’s Garden Marmottan. But winter is not the right time. 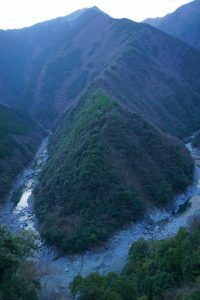 Iya Valley祖谷famous for its dramatic scenery has a rich history of being a way point for wanderers and a place to be away. 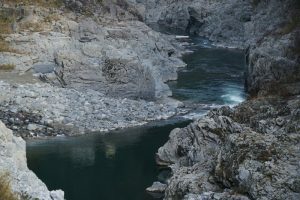 Today, it remains remote with deep gorges, traditional roof homes, historic vine bridges and hot springs. 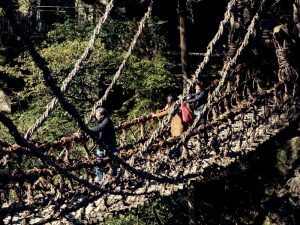 The area is popular for nature lovers and outdoor activities including hiking and rafting. The valley is divided into halves namely Nishi-Iya 西祖谷 and Higashi-Iya 東祖谷. 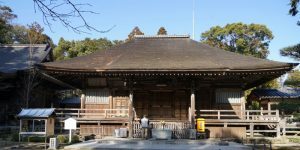 The Nishi-Iya is more developed and visited while Higashi-Iya also known as Oky-Iya (deep Iya) 奥祖谷 is less developed. 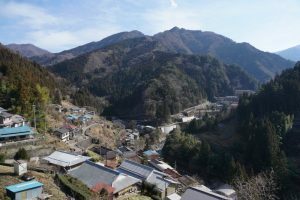 There are dozens of small settlements on the mountain sides. 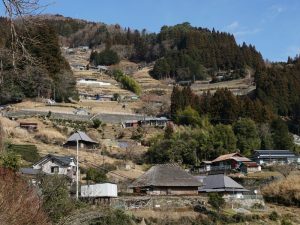 The historic hamlet of Ochiai 落合in the eastern part of Higashi-Iya has been registered as an important national preservation district due to its collection of traditional homes, terraced farm plots and ancient walking paths. We took the old R32 to reach the iconic Iya-no-Kazurabashi (Vine Bridge) around 4 pm. We decided not to pay ¥550 to walk across the bridge as we were keen to reach our hotel before dark. We continued to drive on the old R32 which is a very narrow and winding single-lane road. The landscape is breath-taking. 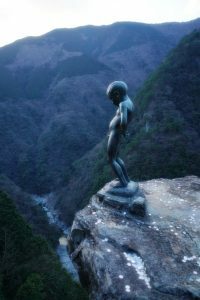 We stopped at the statue of a peeing boy and a view point for a quick photo. But it was too cloudy and dark for good photos. Kylie had a trying time. The narrow road looks scary with too many tight bends and unsteady slopes on our right and cliffs on the left. She was nervous especially when other cars followed her too closely or when she had to navigate to let coming cars through. But being a good and cautious driver, she did a splendid job. We were relieved when we were back on the new R32. We were hungry and stopped at the first decent restaurant by the road side to have BBQ for dinner. We had beef, chicken and beer. The beef though expensive (¥1,000 for only a few pieces) is most delicious: it melts in the mouth. The area is full of expensive onsen hotels. As most of the affordable ones were fully booked, we spent a while the night before in finding and booking accommodation. Finally, we booked a twin road in Hotel Awanoshi. Owing to wrong information provided to us on the hotel’s phone number, we had problem in finding it. The GPS is not easy to handle at times. We were relieved when we finally got there. I enjoyed the onsen and had a good sleep. We had a buffet breakfast at the hotel. The food was surprisingly good with lots of varieties including hot pizza. 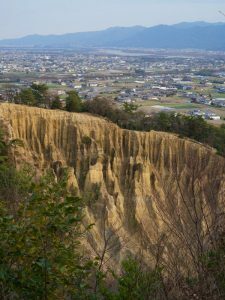 As we had only seen a small part of the valley, we decided to return to explore Higashi-Iya and to check out Ochiai. We were on new R32 and stopped at the departure point for a 30-minute river cruise at the Oboke gorge which is about 8 km long. It was freezing and we were not keen about a cruise which costs over ¥1,080. 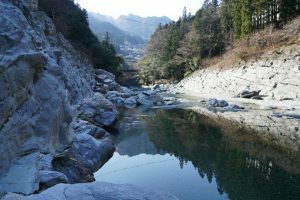 We had one more stop to look at the gorge before crossing the river to drive along the old R32 in the direction of Ochiai. We somehow missed an indication sign for a view point of the hamlets and information centre. Instead, we drove up the road and took a side road leading up to a hamlet. We saw a couple of preserved houses with hatched roof. An old lady was working in her small plot of land. She looks relax, happy and healthy. It was around 11 am when we decided to turn back. We made a sharp turn when we heard a slight noise. After a while, the noise coming from the rear of the car got louder. We got off to check several times and discovered a small crack at the bumper and a shield cover of the left rear tyre was bent / somewhat detached. What had happened? We had no clue as we had not hit anything. Luckily, there was nothing wrong with the engine. The area around the Iya Vine Bridge and the Biwa Waterfall is beautiful especially in the morning with good natural lights. We spent half an hour enjoying the scenery and taking photos. We were back on R32 by 1 pm. The noise was irritating and worrying. We decided to take the car to the Toyota office in Tokushima for a quick check and to seek advice on what follow-up action was required for insurance purpose. We now left behind the narrow one-lane road and could drive faster. We continued to drive on the non-toll road which is slower. While the indicated speed is 50 to 60 km, we note most of the cars are going at least 70-80 km. How does speed control work here? We wonder. Kylie had the Awa Sand Pillars on her list. The spot is not far from the main road. We stretched our legs walking for half an hour to see the pillars at two locations. They are modest in scale especially after what I have seen in Gansu, China recently. The sun was setting soon after we left Awa. We took over an hour to cover some 40 km to Tokushima owing to heavy traffic during rush hours. We arrived in the Toyota office around 6:30 pm. They have. English-speaking staff. This made it easy for us to explain what had happened and when we discovered the problem. A man checked the car and assured us that the engine was fine. He pulled the displaced shield behind the tyre back in position. The staff explained that the slight dent was regarded as “an accident” for the purpose of insurance claim and we should have reported the accident in Iya where it happened. He suggested us drive back to Iya to make a report. This was totally out of question. We explained that even if we had called the police on the spot, we would have had problems communicating with them in English. The staff called the traffic police in Tokushima. Ten minutes later, a nice helpful young policeman arrived. Fujitani consulted his boss over the phone. He looked worried and kept repeating that our case was a difficult one as it was the responsibility of the Iya police. Anyway, he took down the details and told us to go to the Toyota office before 3 pm on January 30. The decision lies with Toyota. We were left in suspense as to what would happen. It was after 7:30 pm when Fujitani wrapped up our case. We asked his advice on where to eat. We followed his motor cycle to a local noodle shop nearby. We had a bowl of noodles and dumplings. The noodles are delicious but too salty for us! But the dumplings are excellent and tasty. It was about 8 pm when we made our way to Awaji Island淡路島. 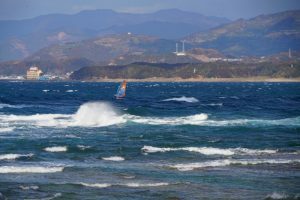 We had thought of staying in Naruto 鳴門in order to see the famous Naruto whirlpools created by the large volumes of water moving between the Seto Inland Sea and the Pacific Ocean between high and low tides, combined with the unique underwater geography of the narrow Naruto Strait. 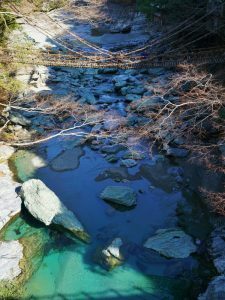 Uzu-no-Michi Walkway was on Kylie’s list to observe this spectacular natural phenomenon. Under ideal conditions, whirlpools of up to 20m in diameters can be observed. 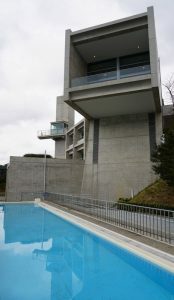 Eventually we picked the Toto Seawind Hotel Awaji designed by Tadao Ando, a renowned architect. 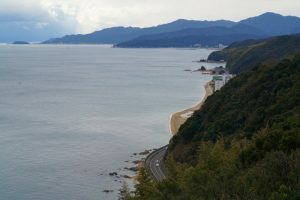 Awaiji Island is connected to Naruto, Shikoku and Kobe, Honshu by the 89km-long Kobe-Awaji-Naruto Expressway. 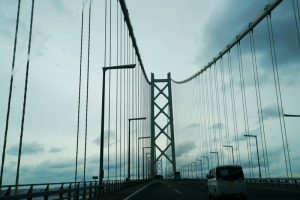 We paid ¥680 toll fee to cross the 1.3km-long bridge to Awaji Island. Then we took the ordinary road N28 to the hotel. it is a long drive. We should have taken the toll road so that we could have arrived earlier. 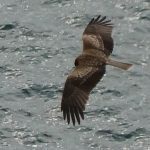 I saw our hotel perching on a hill top from a distance and expected arrival around 10 pm. Unfortunately, the road was dark, and the voice guidance gave us wrong information. When we were told we had arrived at the destination, we were at a loss as we could not find the entrance to the hotel. Being the pilot and vanguard, I tried to find the entrance after Kylie dropped me off at a staircase. It was dark with dim light. I climbed up and was fronted by a glass door and a concrete wall. I peeped through the glass but saw nothing except a pile of stone and empty space (which I later found it was an installation and the stones are made with paper). I thought there must be another entrance and suggested Kylie to drive on. Soon I realised we were heading downhill. I suggested Kylie to drive the car to the car park and I walked back to the glass door again. Looking carefully, I now found a button. I pressed it and the glass door opened this time. I walked in like Alice in Wonderland and called “hello, hello”. Soon, I saw the head of a young lady coming out from the ground (it’s a joke: she came up from a staircase behind a counter). She explained in English the reception was closed at 10 pm. The receptionist and a porter showed us to our room located on the 2nd floor while the reception is on the 8th floor. We descended a bare and monumental-like staircase, walked through another glass door walking in the dark in mid-air towards a hanging lift located on the 7th floor. After taking the lift and walking along the corridor to Room 202, I was struck by cool appearance created by concrete walls, steel, wood and glass. Nonetheless, as soon as I entered the room, I felt tranquil owing to the comfort, warmth and simplicity of the room. The furniture is in light wood colour. The pillow and bedding are excellent. We were exhausted and had a wonderful sleep. I am keen to discover the building so as to appreciate its design concept and spirit. 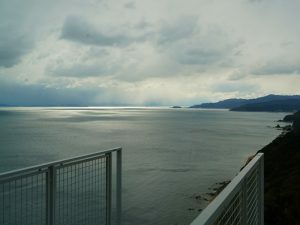 I started with the public bath on 3rd floor where I had a soak while enjoying views of the expansive sea and rising sun. I then found the restaurant and swimming pool on the 4th floor. The breakfast and dinner would cost over ¥3,000 and ¥8,000 respectively. Standing on the 4th floor, I began to appreciate the daring design and layout of the hotel built in a small tight plot on a steep slope. 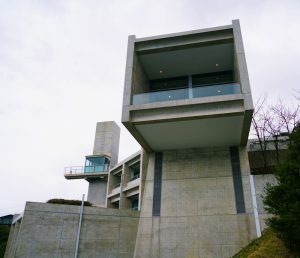 I have been impressed by modern Japanese architecture. Being lazy, I have not read up on Tadao Ando 安藤忠雄 before coming to the hotel. A self-taught architect and winner of the 1995 Pritzker Prize, he is said to create a “haiku” effect emphasizing on nothingness and empty space to represent the beauty of simplicity. His architecture is mostly constructed with concrete providing a sense of cleanliness and weightlessness (Source: Wikipedia). My brief stay has been an aesthetic and sensational journey. Emptiness, space and simplicity can be sensed anywhere and everywhere (especially when I arrived after 10 pm without any idea about the hotel). The few steps leading to the hotel, the subtle entrance, the concrete staircase down to a bare lobby/sitting room, the hanging lift, the guest toilet on 7th floor, the public space with the swimming pool and restaurant on the 4th floor and design of the garden and rooms all look simple but captivating and purifying. 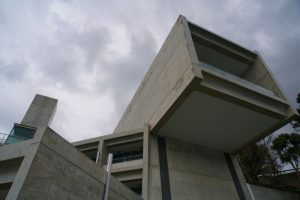 The building has indeed been built in harmony with the area’s topography: it is part of the surrounding natural environment. Everywhere I turn my head in public space, I find the sea, the sky and islands embrace me in front of me. I am glad we have spent a night in this hotel. It has been a total and wonderful experience. 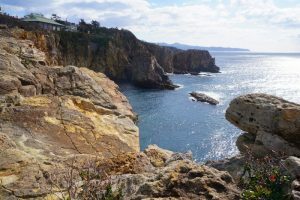 After driving in Shikoku for ten days, we planned to spend five days to explore the Wakayama Prefecture comprising five regions namely Wakayama City, Koyasan, Arida/Yuasa/Hidaka, Shirahama / Kushimoto and Kumano, which boasts a dramatic coastline spanning more than 600km. 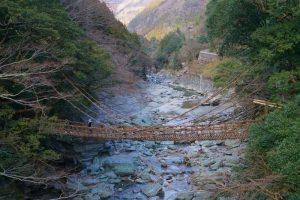 The prefecture located on the Kii Peninsula, Japan’s largest peninsula, is mountainous and famous for its dramatic and beautiful landscapes, onsen and coastline, cuisine and above all the sacred Kumano Kodo pilgrimage routes (a World Heritage Site). 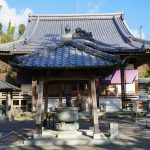 I spent a few days following the Kumano Kodo during the 2017 New Year period and visited all the three sacred shrines and other spiritual and historic sites. 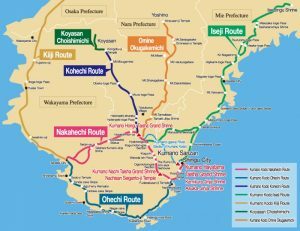 A driving trip with Kylie this time along the coastal Ohechi Route would enable me to discover its coastline, nature and onsen. We left the Toto Seawind Hotel after 10:15 am and took the expressway to Wakayama via Kobe and Osaka. Expressway is fast but expensive and boring. Hence, we took expressway only to Wakayama (spending a toll fee of about ¥2,000). We stopped in the city and had a nice lunch in a steak house around 1:30 pm. By 2:30 pm, we were back on R42 heading to Shirahama. Today, we had four seasons in one day. We started off with rain which soon turned into sleet and snow. When we were in Kobe, we had bright sunshine. 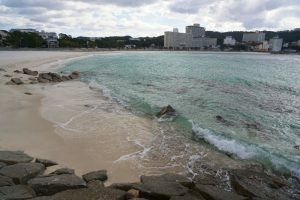 It was cloudy and freezingly cold when we walked to the restaurant in Wakayama. Then it rained again. 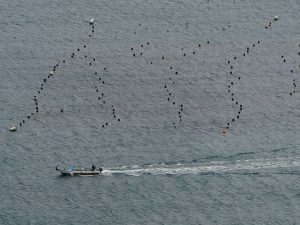 It was a long drive to Shirahama owing to heavy weekend traffic on R42. I ran into trouble when the battery of my phone was gone. With the phone, I could not retrieve the information on the phone number and address of Grampus Sea Hotel, which Flora who would join us for a few days, had booked for us. We stopped in a 7-eleven shop and asked a staff to find the phone number of the hotel so that we could key it in the GPS. We eventually arrived at the hotel just before 6 pm. It’s great to meet up with Flora who had already spent a couple of days in Wakayama. Flora told us that she would take the train to Koyansan instead of joining us. No problem. 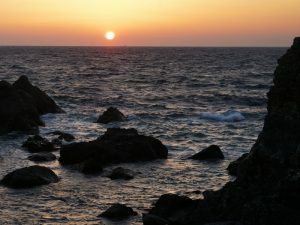 Shirahama 白浜is a well-known onsen region with some 120 hot springs. But most of the hotels are over-priced especially during the weekend. We paid over HK$1,100 for a small twin room with breakfast but without a wash-basin and toilet. The only good thing about the hotel is its onsen. I spent over an hour enjoying its three outdoor and two indoor pools. We said good-bye to Flora after breakfast. 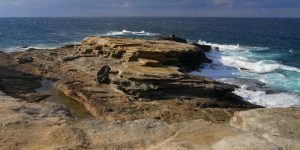 We spent a leisure morning visiting a few attractions in Shirahama. 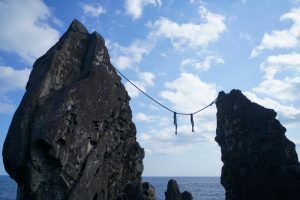 The Senjojiki is a tiered rock formation a few minutes’ walk from our hotel. The rocks look beautiful in the morning lights. 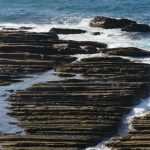 The Sandanbeki is a rocky coast with steep cliffs about 50m high and approximately two kilometres long. 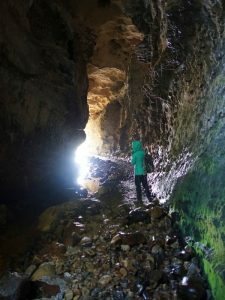 Visitors can visit a cave by taking a lift. The entrance fee is ¥1,300 pp. We decided not to go. 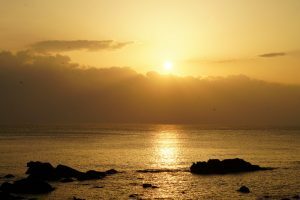 The Engetsu Island a symbol of Shirahama renowned for its arch, is said to be Kansai region’s foremost spot for viewing sunset. The park located at the tip of the peninsula next to an aquarium. We walked to the highest viewing platform for panoramic views. We drove along the coastal road and stopped at Susami for lunch with full view of a black sand beach. After a short drive, we stopped at Bush a café bar – restaurant with unbeatable view of the picturesque Lovers’ Cape and the ocean. I had a lime yogurt while Kylie had a coffee. Both were excellent. 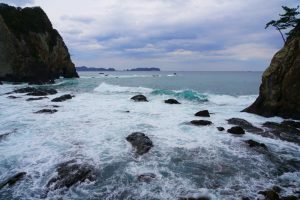 We arrived at Kushimoto 串本町around 4 pm and found our way to Cape Shionomisaki潮岬, the southernmost location in Honshu with a white-walled lighthouse built on the cliff in 1863. It was a beautiful sunset. We spent some time taking sunset photos. Then we drove several kilometres to see the Hashigui Rock (the Bridge Rocks) which could provide a spectacular foreground for sunset photos. For amateurs, it was too late. But I found a professional photographer just setting up two cameras (one with fish-eye lens) on tripod. I was puzzled and watched a while what he was trying to do. He later showed us his photos which captured the blue sky with the rock. It was after 6 pm when we were back on the road heading to Katsuura 勝浦市. 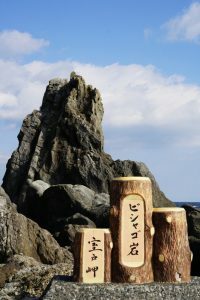 On my last visit to Katsuura, I learned about Hotel Urashima located on an island with cave onsen. As I would like to try the famous onsen, I booked a twin room with breakfast for over HK$1,100 a night. 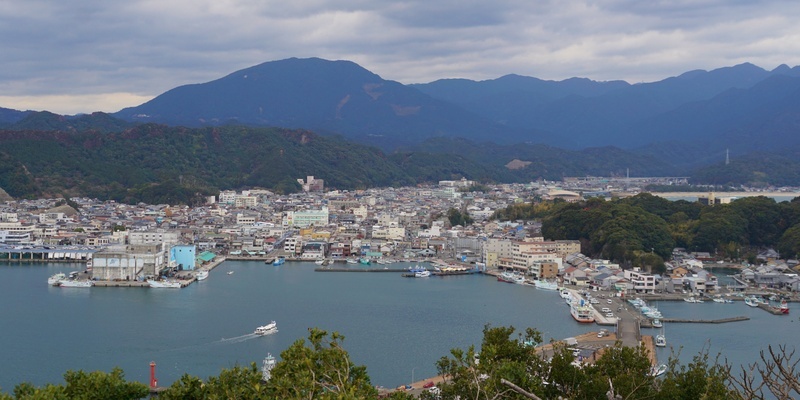 Hotel guests and day-trippers to Urashima have to take a boat from the pier. We were not told to leave our car in a designated car park till we were at the pier. We had problems in communicating with the staff. Though we arrived in time for the 7 pm ferry, we had to find the park first. I finally took the boat at 7:20 pm. Kylie who had left something in the car, had to return to the car park and took the next boat at 7:40 pm. 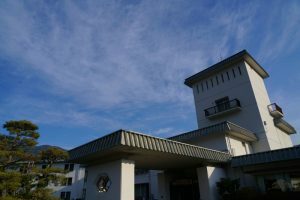 Hotel Urashima is a huge complex comprising three separate blocks namely Honkan and Nagisakan facing the harbour and Sanjokan at the hill top connected to Honkan by three escalators. 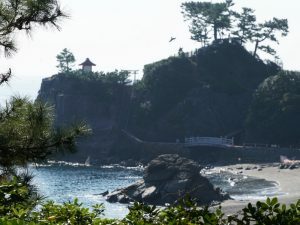 There are four onsen including two spectacular cave ones facing the sea. Each onsen has separate sections for men and women. Onsen Bokido is the largest one with nine pools. 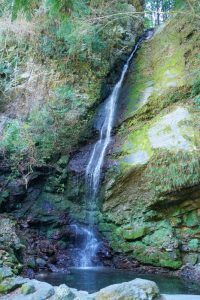 The second cave is called Onsen Genbudo with three pools in the ladies’ section. The two indoor ones are Onsen Takinoyu and Isonoyu. 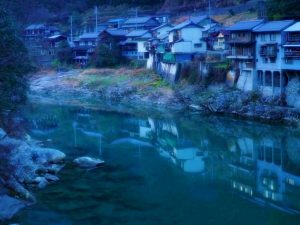 The receptionist suggested a visit to Onsen Bokido both at night and in the morning. I followed her advice and realised the reason. That evening, I went into an enormous onsen like a maze with five pools. The following day, I found myself in another part of the cave with four pools. 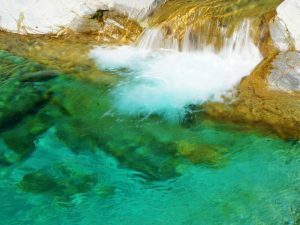 It is a fair way to enable both sexes to enjoy this unique cave onsen! 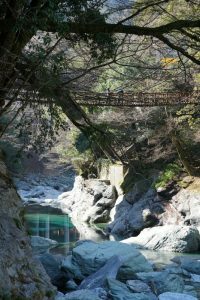 I spent less than an hour in the two cave onsen with milky water and strong smell of sulphur. 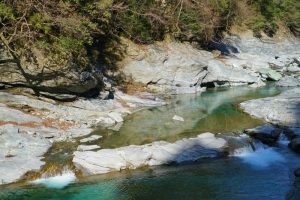 For people with high blood pressure, it is not advisable to spend too long in an onsen especially when the water is boiling hot. I know and always live with my limitations.